Like many women with boss jobs, Johanna Peet once found respite from her role working in counterterrorism at the State Department by hitting up beauty emporiums “to self-soothe and have fun,” she says. The only hitch in freely enjoying these wonderlands—testing an array of samples as she strolled the aisles and purchasing new products with abandon? Her complexion was on fire. “Suddenly, all these trendy products I was using were super-irritating to my skin,” she says. And she’s not alone. A 2009 study published in Clinical and Experimental Dermatology found more than 75 percent of people surveyed claimed to have sensitive facial skin. Peet stopped using the skin-maddening formulas and got to work researching natural skin care. Her goal: to create a brand that would not only provide the kind of luxurious and relaxing experience that women were craving, but also one that would allow her to exercise a level of civic mindedness. The result is Peet Rivko, a unisex, vegan, cruelty free, small batch beauty brand (beloved by Peet’s childhood friend actress Aubrey Plaza) that elevates the sensitive skin category from its often clinical pinnings to one that feels high-end and luxe, as well as delivers on social impact. It features only four products—a streamlined, three-step facial skin-care range (which includes a cleanser, moisturizer and face oil) plus a body oil—and engages in a give back program, which donates one percent of its sales to New York City-based environmental nonprofits. Keep scrolling to learn the secrets behind this sensitive skin line. To keep formulas copacetic for sensitive skin types, Peet knew she wanted to source ingredients that tick all the “non-irritating” boxes. According to her research, that meant weeding out the usual suspects like parabens, sulfates, phthalates, PEGs, phenoxyethanol, silicones, scent blockers and petroleum. Also on the chopping block were some beloved natural ingredients—such as nut oils, essential oils, and floral extracts—which have been known to be irritating for some people with sensitive skin or allergies. To avoid falling into the greenwashing trap that haunts some brands, Peet had to find ingredients that kept formulations—and her conscious—clean. For example: While some beauty brands use solvents to extract oils, Peet goes another route. She uses oils (like avocado, and prickly pear seed and jojoba seed) that are unrefined and cold-pressed in a sustainable way. “Using unprocessed and unrefined oil is very expensive, but we’re making an investment in the quality of ingredients,” she says. Her thinking is that it’s quite different to pluck an heirloom tomato straight from the garden versus using a canned one, and since her formulas are so simple, that quality control really makes them stand out. Strict quality control lends itself to a lean line—one that Peet says won’t change anytime soon. Although she’s flirting with the idea of creating a sensitive-skin exfoliant down the road, you won’t see a fleet of brand new Peet Rivko products land in stores and online every six months. Because as the girl who once loved experimenting with all kinds of beauty products has learned, streamlining her skin-care routine not only made for brighter, healthier skin, but it also took the pressure off of constantly adding onto an already expansive (and expensive!) regimen. “Once I started using fewer products with fewer ingredients, my skin bounced back 1000 times happier,” Peet says. That being said, she doesn’t want to discourage those who love beauty from trying lots of products. But she’s also making life a heck of a lot easier for those who become overwhelmed at the sight of a Sephora. “We’ve taken the fluff out,” she says. In other words, you can take really good care of your skin with just one cleanser and just one moisturizer. Business types might tell Peet that her philosophy is bad for financial growth. But for those of us who just want to take good, clean care of our skin and get on with it, the less-is-more approach is a much-needed breath of fresh air. 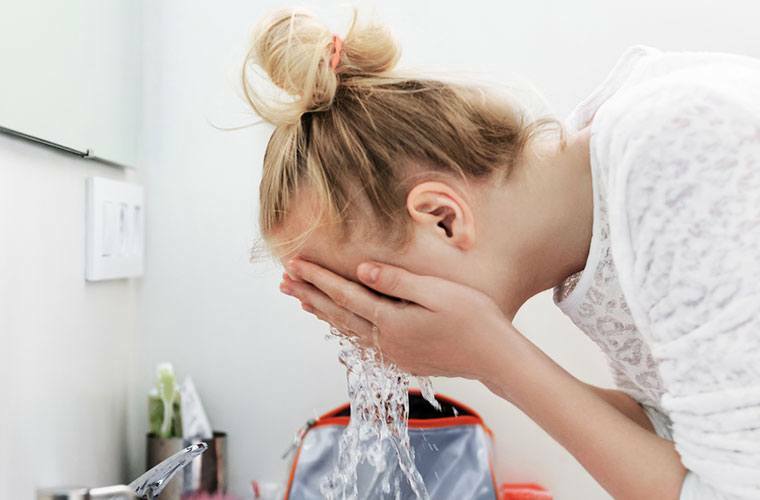 If you’re all about less-is-more skin care, check out our busy girl’s guide to taking care of your skin and find out if it’s actually bad to stop washing your face.